Getting in shape is easy—once you’ve found the right facility and class schedule. With so many aerobic and strength-training options available, it’s important to find the one that fits your style. If you don’t love what you’re doing, you’re unlikely to continue. Choosing one of these latest fitness trends is a fun and exciting way to gain control of your health at your favorite health fitness center in Phoenix, AZ. If you’re looking to jam, tone up, and slim down all at the same time, Pound is right for you. This full-body work out combines using slightly weighted drumsticks to pound out rhythms. Fusing plyometrics, Pilates, and strength training together, Pound is the perfect 45-minute workout. If you’re not musically inclined, don’t worry—Pound is about enjoying the moment. It’s simple to follow and doesn’t require any sort of prior experience. Biking is no longer an outdoor hobby. Take your love of cycling to the next level by participating in a spin or cycling class. This group exercise course is designed to get your heart pumping and your blood flowing. Using various settings and speeds, your course leader will have you sweating and burning calories in no time. Plus, using lights and music to amp up the atmosphere, you’ll feel like you’re in taking on the world every time you get on your bike. Mountainside Fitness even has classes with a live DJ to help you get motivated. It’s no secret that ballet has always required extreme core and muscle control. Barre fitness classes are now taking the exercises used by ballerinas and combining them with cardio. Using a barre, your instructor will teach you specific moves to sculpt your muscles and build your strength. It’s a fast-paced, energetic way to embrace the fluidity of dance while also boosting your endurance and flexibility. 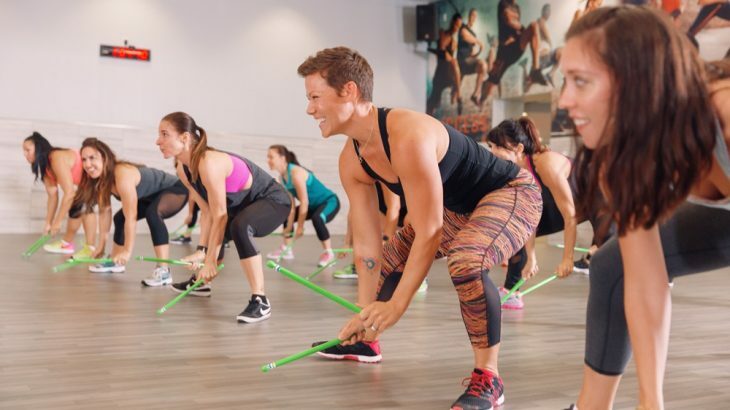 Mountainside Fitness offers three types of barre classes: Barre Classic, Barre Sculpt which places emphasis on heavy resistance training and core, and Barre HIIT which adds cardio and low impact plyometric intervals to raise the heart rate. Aerobics are back, but they’re not the same. If you think of big hair, neon colors, and leg warmers when you think of aerobics, it’s time for a reinvention. HIGH fitness classes combine the advantages of aerobics with fast-paced, modern music. With high-intensity interval training and plyometrics, you’ll improve your strength while getting the cardio that your heart craves. Yoga is one of the best ways to center your emotions and build strength within yourself. By creating an atmosphere of serenity and peace, yoga allows you to dig deeper in order to balance. Whether on the mat or in real life, regular yoga sessions are a great way to de-stress Yin Yoga, especially, is a type of yoga designed to strengthen the joints. By holding certain poses for long periods of time, it stretches the tissue and improves flexibility. If you are looking for a maximum calorie burn you may want to consider a heart rate monitored interval based class designed for higher calorie burn, at an accelerated rate, for an extended period of time, known as EPOC. These small group, high energy classes use a combination of TRX, Rowers, Treadmills and a variety of strength training equipment. The class is designed for all fitness levels and because these classes are held for smaller groups, most require priority booking, otherwise limited space available on a first come basis. Finding the right classes at Mountainside Fitness, a wellness fitness center in Phoenix, AZ, is key to your health journey. With over 80 classes per week included in your membership, Mountainside Fitness has something for everyone and accommodates all levels. Whether you prefer the fast-paced atmosphere of a spin class or the stress-free environment of yoga, start moving today!